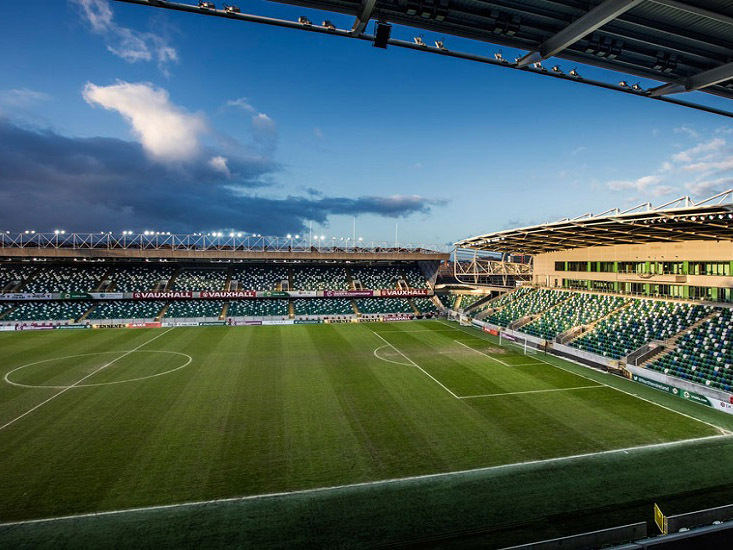 Originally opened in 1905, The National Football Stadium at Windsor Park in Belfast, Northern Ireland has recently undergone a major renovation, following £31m of funding from the Northern Ireland Executive. Now that the work is complete, the stadium can now welcome 18,434 supporters, all of which are seated undercover. Vital to the upgrade was a fully integrated PA and voice alarm system that was both EN54 compliant, with an impressive STI value, but at the same time incorporated a dynamic full range entertainment sound system to enhance the match day experience – both for and Linfield F.C., and Northern Ireland’s national team, who also play their games at the stadium. It is also the headquarters for the Irish Football Association (IFA). 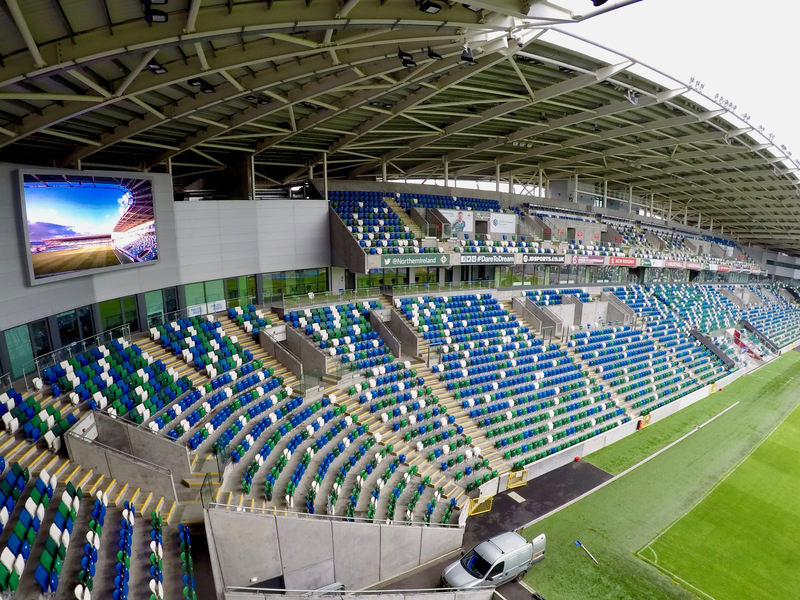 World-renowned consultant, Arup provided engineering and technical expertise, through its Belfast team, who were involved in the transformation of Windsor Park into the National Football Stadium from concept through detailed design, providing the IFA with multidisciplinary (SMEP) building engineering services as well as geotechnical and fire engineering services for the refurbishment. Arup also set out a tender for the technology upgrade, which was won by Belfast-based RCF partners, MGA Communication. The company was tasked with carrying out the implementation of commentary/broadcast systems, as well as disabled refuge, working under electrical contractors Wm Coates; the solution was based around an RCF DXT7000 emergency evacuation system and Acustica P-Series stadium loudspeakers. 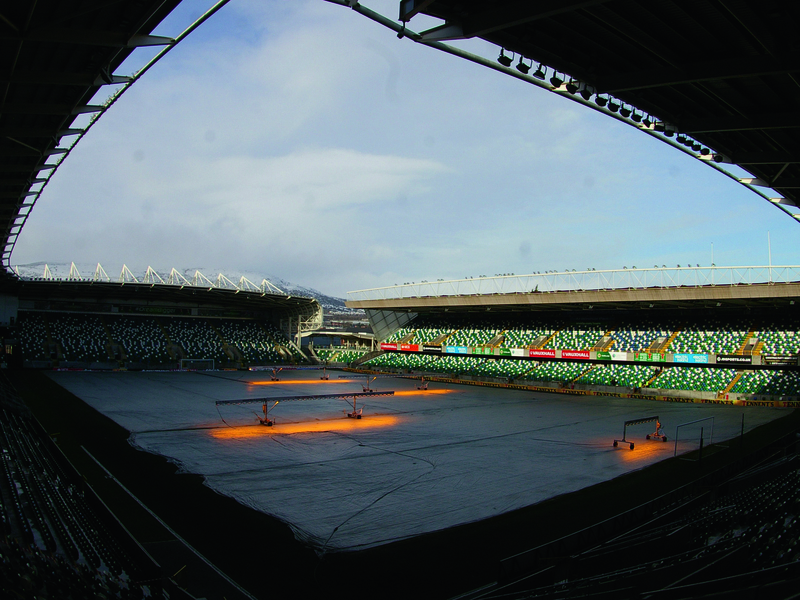 The main requirement at Windsor Park was for the installation to be EN54-16 compliant for the electronics, EN54-24 for the speaker systems and the overall installation to be BS 5839 (Part 8) compliant. The system also needed to meet current FIFA requirements. MGA was tasked with carrying out the implementation of commentary/broadcast systems, as well as disabled refuge, working under electrical contractors Wm Coates; the solution was based around an RCF DXT7000 emergency evacuation system and Acustica P-Series stadium loudspeakers. There is a fireman’s mic in each of the stands on a local buss, and the entire signal path from fireman’s microphone to loudspeaker lines is completely and automatically monitored against faults within the DXT7000’s 8 x 80W matrix. Included in the coverage are the pre-existing speakers in the administrative offices in the main stand. A commentary system for the hearing impaired is also provided via a line output from the RCF PA/VA and there are various XLR inputs for mixer plug-ins. Finally, the multi-zone paging mic is located in the master control room overlooking the pitch. The main entertainment PA comprises 45 P6215 15-inch coaxial weatherproof 60° x 60° loudspeakers which are IP55-rated, driven low impedance by RCF IPS 3700 amplifiers. These are spaced in clusters of two along the lip of the stand roof. Positioned alongside, are pairs of the EN54-24 compliant overlay system comprising IP66-rated HD21EN 30W ABS horns, co-located with each cluster. The exception to this pairing is the East stand where only single enclosures of each were required. The horns immediately come into play in the event of a failure of the main system, providing seamless UPS. To set the splay angles of each cluster for optimum stand coverage required the commissioning of some bespoke bracketry by the electrical contractor William Coates. This was designed and fabricated with separate tethering for safety purposes. Working in tandem with MGA Communication was another locally-based system integrator, Ashleigh Signs, who like MGA also won its position through a tender process, but this time for a digital display solution. 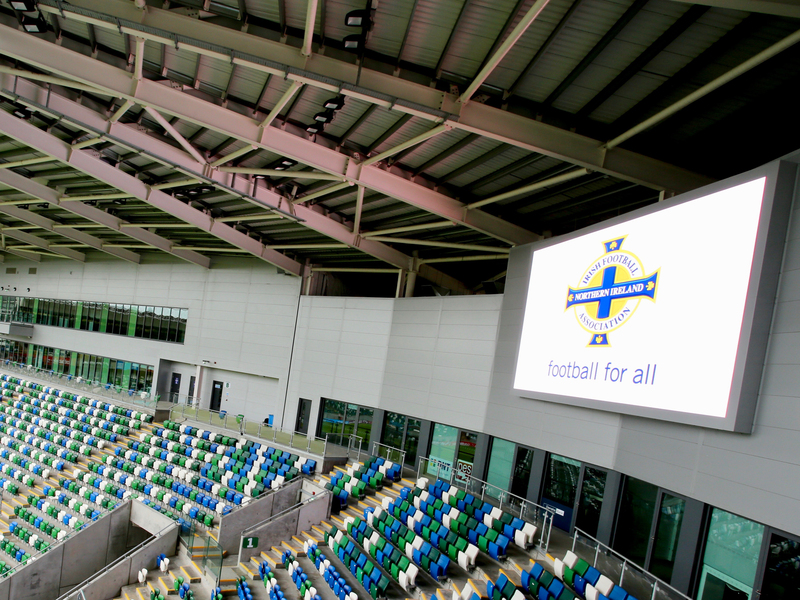 Prior to the upgrade, the IFA used to hire in a large screen for international games, but it became clear over time that this was not a cost-effective long-term solution, nor in keeping with the expectations of today’s fans in an increasingly digitised world. The brief was to deliver a solution which would have the capability to offer replays of key action, live match feeds, stadium updates, commercial advertising opportunities and an overall better experience for visitors to the stadium. After evaluating the key features and benefits offered by a number of products, the IFA settled on Absen’s XD10 LED display screen. Boasting a 10mm pixel pitch, 6000 nits of brightness and 120º of horizontal viewing angle, the XD10 offers real-time monitoring from PC, tablets and smartphones, giving the user complete control locally or remotely. With a panel thickness of just 106mm and weighing only 21kg, the Absen XD10 is thin and light, saving on installation space where it is at a premium, and making delivery and installation convenient and easy. Front and rear servicing make the IP65/54 waterproof module easily accessible for maintenance. Whilst the XD10’s product specification meant it could clearly deliver against the original brief in terms of end user benefits, a number of its key features also helped the Ashleigh Signs team to overcome challenges on site during the installation process. Space restrictions around the perimeter of the football pitch meant that regular access equipment could not be used, and scaffolding was the only solution. Weighing 20% less than traditional panels, and with a depth that is also typically a third thinner, the XD10 cabinets ensured a fast and successful installation. The 43sq metre Absen XD10 screen was deployed in an 8.96-metre wide by 4.8-metre high configuration. Reinstatement of the cladding around the screen allowed it to tie in seamlessly with the stadium’s overall aesthetics. The content is delivered to the screen by Goalsport Mini – an intuitive and user-friendly system by Czech firm Daite.